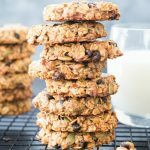 These Healthy Breakfast Cookies made with Banana, Oatmeal, nuts, seeds are gluten-free and Vegan. These make-ahead breakfast cookies are perfect for busy mornings. 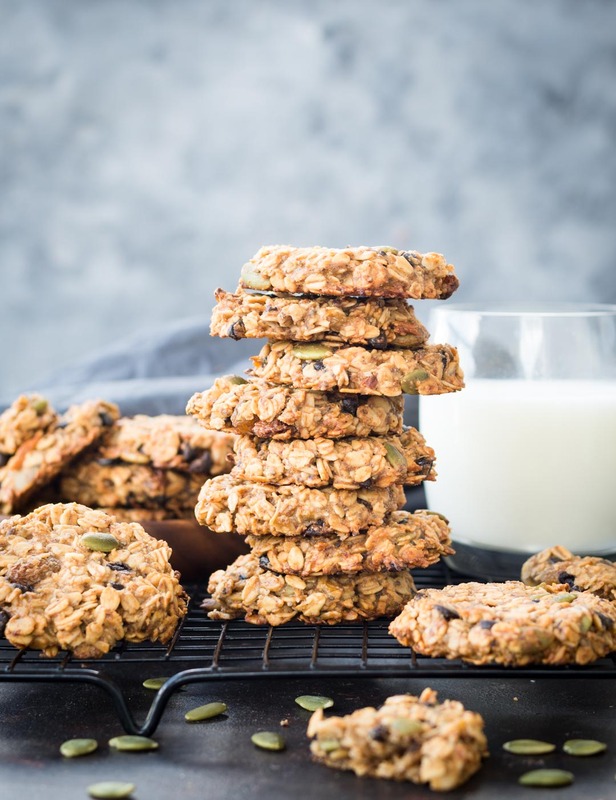 These Oatmeal Breakfast Cookies with wholesome ingredients like Oatmeal, seeds, nut, banana, nut butter are vegan and gluten-free. 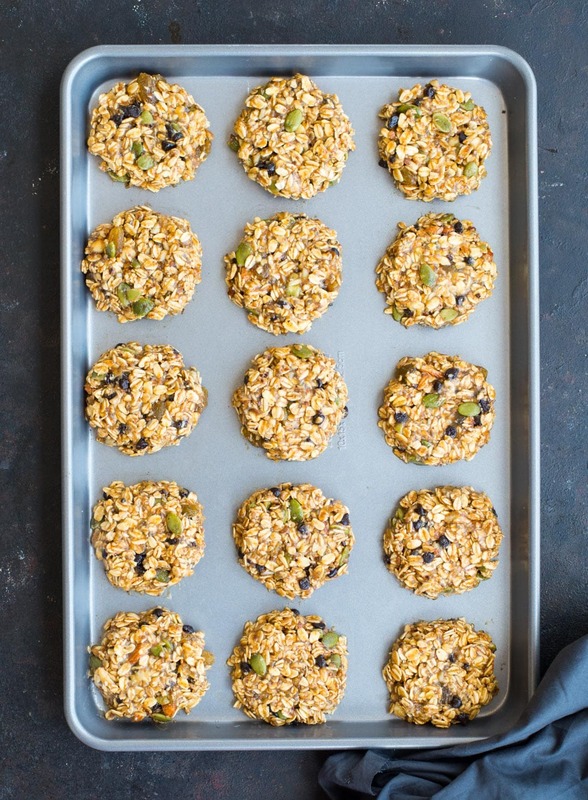 These Breakfast Cookies are going to be your best friend on busy mornings. 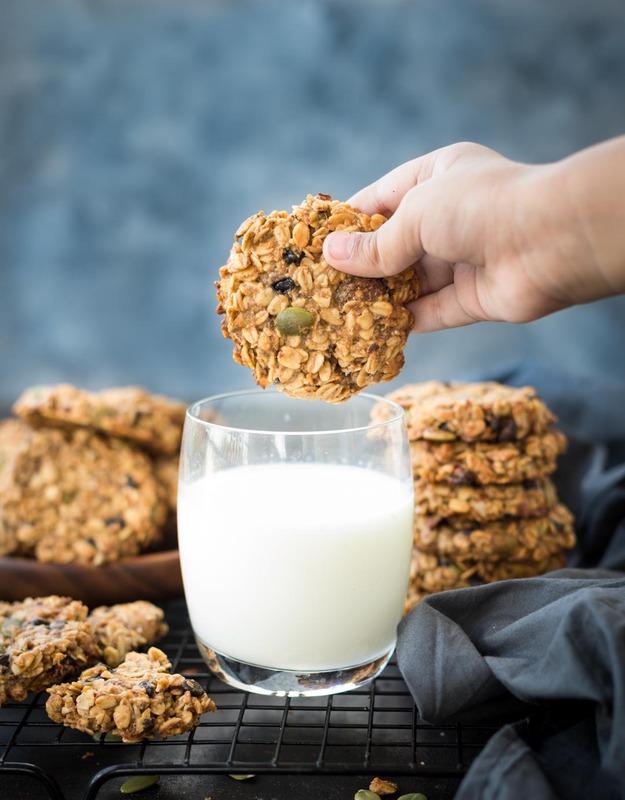 When you are running behind chores and don’t have time to have your morning meal, these healthy Breakfast cookies are going to be your saviour. These Breakfast Cookies doesn’t have any refined sugar or refined flour. These are rich in fibre, protein and other nutrients. You can munch on these without any guilt. And these cookies are kid approved too. My little one doesn’t leave my side while making these cookies. How does your morning look like on weekdays? 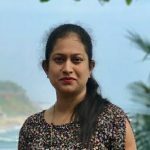 If you have a school going kiddo and husband who leaves for office early, then I am sure it is no different than mine. Weekday mornings are nothing less than a horror to me. Kiddo’s School, Husband’s office, cooking, I lose my temper every single day and start yelling at everyone. And among all these when your stomach is growling with hunger, believe me, that makes everything even worse. These make-ahead breakfast cookies really come handy on morning rush hours. These are very easy and quick to make. I doubt anything can go wrong with this recipe, even if you are not an avid baker. There are four main ingredients in this cookie recipe, that forms the base. Once the base is ready, you can add pretty much any topping to it. To make the cookie base you need Oatmeal, Banana, Honey/Maple Syrup and any nut butter. Other ingredients like Chocolate chips, dried fruits, raisins, dried berries. Banana, Maple Syrup and Nut Butter act as a binding agent in these cookies. After the Cookies dough is made, if it is holding together and is sticky that means the dough is of the right consistency. There is no fear of the cookie falling apart once baked. 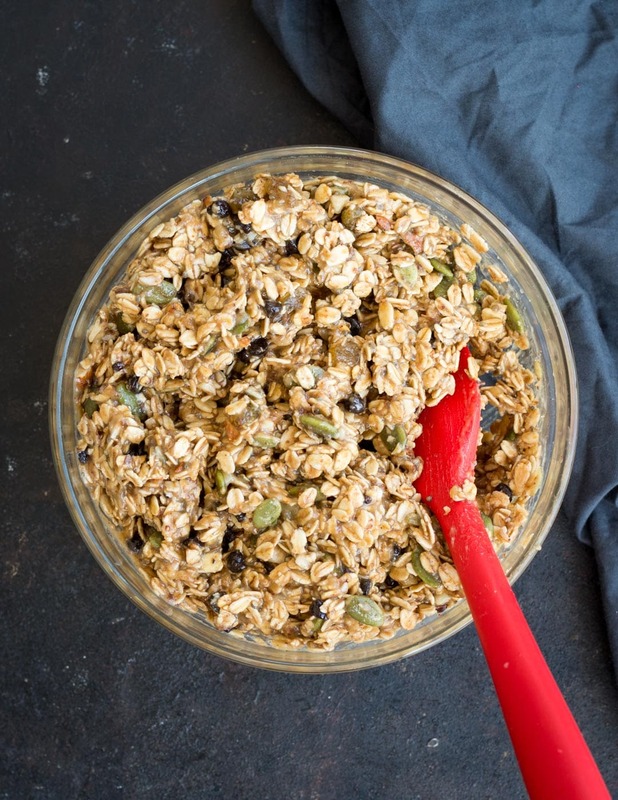 Another trick that works for me is putting rolled oats in a food processor and give it a couple of pulses. Breaking whole rolled oats requires less amount of binding agent. And breaking down the whole oats also make it easier to chew, especially for my little one. 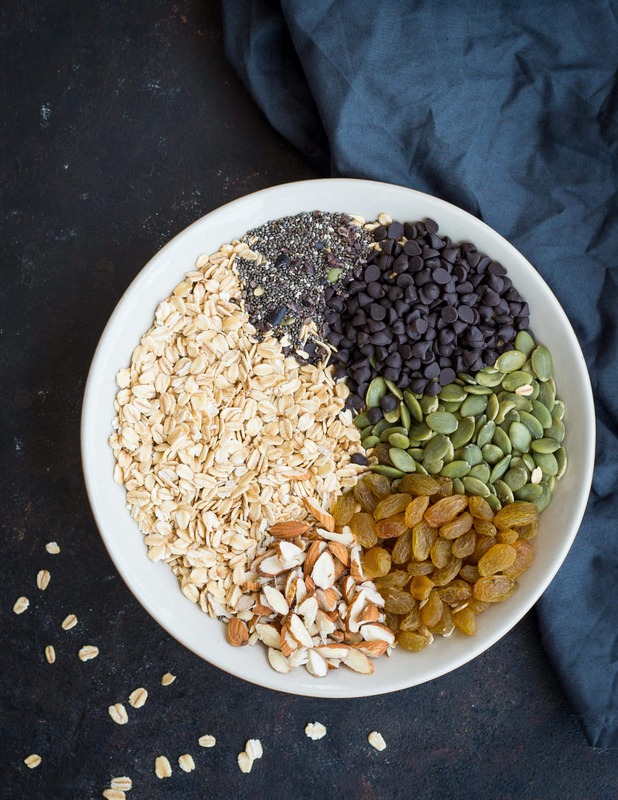 Shaping these Healthy Breakfast cookies is not that difficult. Like shaping any other cookie, use a small ice cream scoop to make even portions. Drop it on a cookie tray. Then using a slightly wet hand press the cookies to the desired thickness. These Cookies doesn’t spread at all after cooking, unlike regular cookies. So you need to press it to the desired thickness before baking. CAN THESE BREAKFAST COOKIES BE FROZEN? Absolutely! You can freeze them after they are baked. Make sure to separate the cookies with a small piece of parchment paper while stacking, else it might stick together. If you want to freeze them unbaked, then line the cookie tray, shape the cookies and place in the freezer. Once they are hard, stack them and keep in freezer safe Ziplock bags. If the cookies are not over the same day, store them in an airtight container. 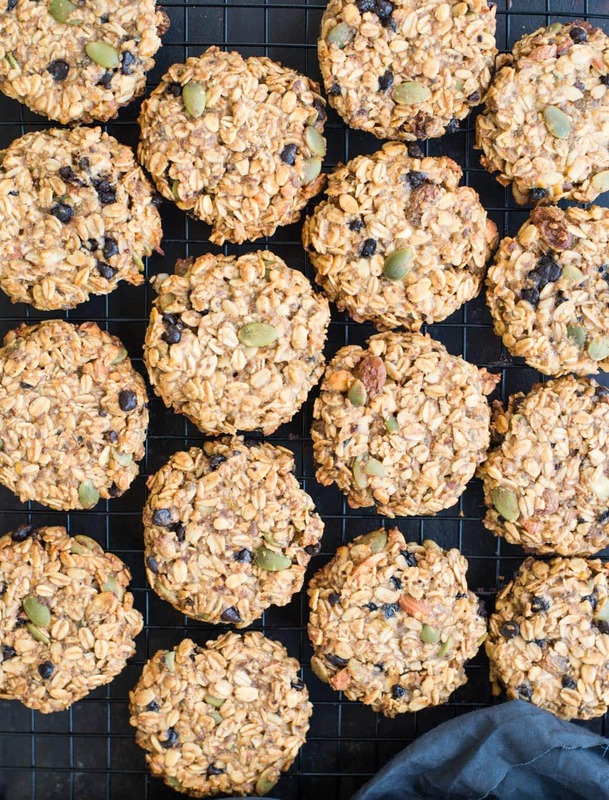 These healthy breakfast cookies stay well at room temperature up to 5 days. You can also freeze them as mentioned above. Dunk these soft and chewy cookies in a glass of milk. I love to snack on them. In fact, most of the time these cookies are my pre-workout snacks, along with a mug of espresso. Check out this awesome HEALTHY BLUEBERRY BANANA GRANOLA BAR. 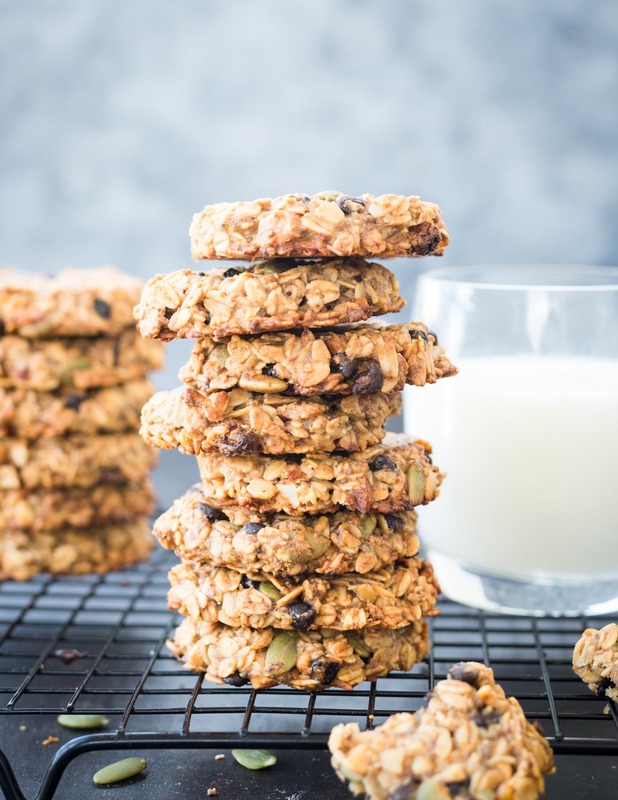 Easy and Healthy Breakfast cookies made with Rolled Oats, Banana, nuts, seeds. These are Vegan, Gluten Free and there is no refined Sugar in this. Take a big mixing bowl. Smash the ripe bananas using a fork until there are no big lumps. Add peanut butter, honey, vanilla extract to pureed banana, salt, baking powder, cinnamon, flax meal. Add rolled oats, nuts, seeds, raisins to the banana mixture. Using a spatula mix everything well. Let it rest while you preheat the oven. Using a small ice cream scoop take portions of the dough and place it in a baking tray. With a slightly wet hand press the dough to the desired thickness. At the end of baking time, the edges would have been crispy but it will feel soft at the centre. But it will harden up once cooled down. Because the nut butter was unsweetened, I have used little more honey. If you are using sweetened nut butter then skip honey. Add 2-3 tablespoons of warm water to the mixture to get the desired consistency. if you feel the centre of the cookies very soft at the end of baking, try baking it for 5 minutes more.